Employees whose children are in a safe, supportive preschool can have better attendance and focus on the job. As an employer, you can make a difference in the lives of your employees and their families by connecting them with Preschool Advantage. 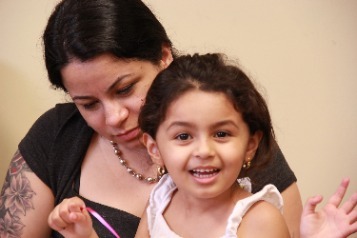 Preschool Advantage has been assisting hard working families in Morris and Somerset counties for over 20 years. If you have employees who are unable to provide their child with the the quality preschool education that will prepare them to succeed in school, please let them know about our program! Applications can be submitted starting January 1 for the next school year. Those received by February 28 will be given priority in funding decisions. Click here to learn about the admission process. Click here to download the English application. Click here to download the Spanish application. Click here to see a list of our partner preschools. 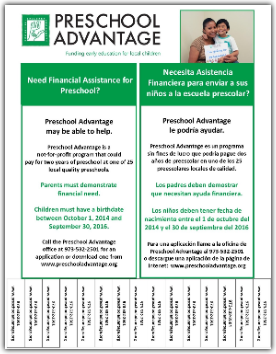 You can help the lives of your employees and their families just by letting them know about Preschool Advantage. Click below to view our printed brochure, info card and flyer. 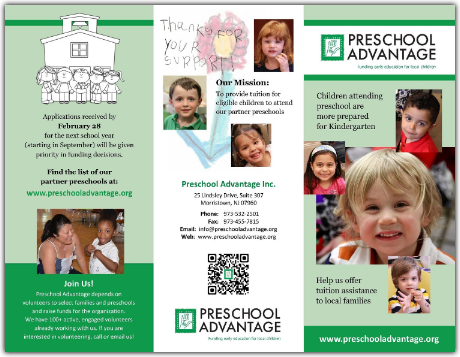 If you would like a supply of printed materials to share with your employees, or for more information on the program, please call us at (973) 532-2501 or email info@preschooladvantage.org.